Would you like to see your windows look pristine without wasting time, energy and much money? You can succeed in this now – just let the specialists of window cleaning in Oakleigh take care of this burden for you. We ensure that all parts of your windows are in perfect state – glass surfaces, frames and window ledges. You can be certain that your property is in good hands time for spare indispensable. assignments this is not all – the But to will come to you break away from house tasks with together countless. We also provide our professional services in nearby areas: Trent Park, Hadley Wood, Enfield Chase, Whetstone, Cockfosters. 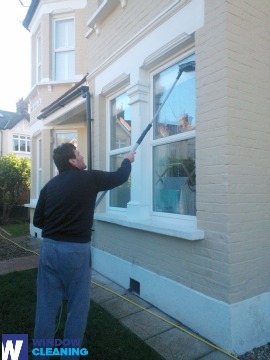 We provide residential and commercial window cleaning by using advanced approach. You can rely on our skills for all types of glass surfaces, roof windows and greenhouses. For windows placed up to your fourth floor, we use water-fed extension poles. This system is convenient and allows risk-free cleaning procedures – the poles are connected to the water supply in the van. For high-rise window surfaces, our rope access option will grant you speedy and effective end results. You can profit from these methods right now – just dial 020 3746 3113 and book a visit! You can count on the cleaners for both private and business window cleaning. All kinds of glass surfaces are included in our professional practice. For instance, you can book a service for cleaning small or double windows, sash ones, French doors, patio doors and bay windows. Besides these, we clean and polish garden window surfaces, greenhouses and roof glass. At home or at your workplace, you can always ensure crystal clear glass surfaces – just phone us! We have the right skills and the right methods for the task. You will appreciate the perfectly looking office with the help of the experts of commercial window cleaning. You can depend on our first-rate services for every kind of business premises. For example, if you have a small shop, we can thoroughly polish its windows by using water fed extension pole tools – it allows us to as high as the fourth floor. If you require spotless look for the glass panes of a skyscraper in London and the surrounding areas, we will make use of our rope access gear. In any case, you will get superb results immediately. You will have absolutely clean home after the professional window cleaners in Oakleigh visit you. We deliver superb services for the entire London locality. The most advanced techniques are included in our working routine – including water-fed extension pole system and and jet washing. You will see for sure the change in your home – we use purified water for the process of inside and out window washing. Give us a call now on 020 3746 3113. Our customer representatives will help you and answer any questions. In addition, you can use our on-site booking from.